Provides excellent protection against scuffs and knocks on interior wood. 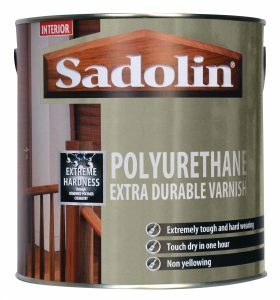 Use on Interior wood and furniture, including skirting, doors, tables, cupboards, sills, panelling, shelving, banisters and shelf rails. Water based & non yellowing. Touch Dry 1-2 hours. Recoat in 2-4 hours. Available in 1 & 2.5 litre packs. For coverage details and to work out the quantity for your job, use our calculator. 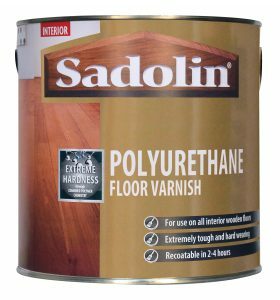 A convenient one-pack product, offering hard wearing protection to all wooden flooring, including hardwood and softwood boards and parquet. Not suitable for laminate flooring. Water based. Touch Dry 1-2 hours. Recoat in 2-4 hours. Available in 2.5 & 5 litre packs. For coverage details and to work out the quantity for your job, use our calculator. This quick drying, water based, stain provides UV protection from sunlight, preventing colour fade, and has a tough finish for everyday wear and tear. 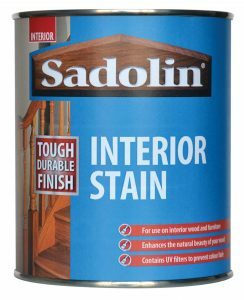 Use on interior wood and furniture, including skirting, doors, tables, cupboards, sills, panelling, shelving, banisters and shelf rails. For an extra tough finish, overcoat with Polyurethane Varnish. Touch Dry 1-2 hours. Recoat in 2-4 hours. Available in 750ml packs. For coverage details and to work out the quantity for your job, use our calculator.